Record keeping is a fundamental component of the Farm Environment Plan implementation. There are a range of methods that you can use to store and manage your data, including farm calendars, farm maps, whiteboards, computer databases etc. We have had a number of requests from shareholders asking for a booklet to be able to record aspects of irrigation management, effluent management, fertiliser applications, and supplements imported and exported off farm. See below for both an excel version you can store on your computer, or a pdf version if you would like to print off and keep in the shed or truck. This review provides a brief summary of regulatory requirements around stock exclusion from water ways in the Canterbury region. In addition reference is given to steps the dairy industry has taken. Comment is also provided on potential policy and planning changes that may occur in the future. 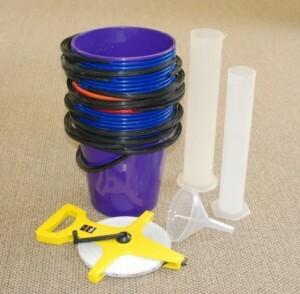 Opuha Water have two ‘bucket kits’ available to lend shareholders to test the performance of your irrigators. The kit includes guidelines and worksheets which enable you to do the testing and calculations yourselves. The purpose of undertaking the Irrigation Performance quick test is to determine the depth of irrigation applies during an irrigation event and how uniformly the irrigation is distributed. Effective and efficient irrigation maximises productivity and profitability, and minimises water use and leaching. Contact Julia on 021 535 174 or julia@opuha.co.nz if you would like to borrow the bucket kit to undertake a performance test on your irrigator. An internet information resource for all things irrigation in NZ. It contains fact sheets, articles, presentations, reports, current research projects, practical irrigation tools, links to other websites, field days and workshops. Guidelines and worksheets for a series of do-it-yourself, in-field irrigation system calibrations e.g. ‘the bucket test’. Online information and resources relating to nutrient, effluent and water management. An online resource to provide farmers with ideas about how to improve their on-farm environmental management. There are simple solutions and techniques to help with most on-farm environmental issues. Workbooks and guidelines targeted at environmental issues on sheep and beef farms. Why, and how, to measure soil moisture. A step by step process to design, budget, and prioritise waterway management on your farm. A ‘How to …’ guide for farmers using their own fertiliser spreading equipment to ensure its performing correctly. Step by step instructions on how to calculate storage requirements and to ensure your system meets those requirements.